In what has been described as a "sharply worded" opinion, the Pennsylvania Superior Court has handed down a decision overturning a $3.4 million dollar legal malpractice jury verdict that former Judge Mark A. Ciavarella entered in favor of a client of attorney Robert J. Powell based, in part, on ties between the two that amounted to "judicial impropriety." This case is the second case handled by Ciavarella that is being sent back for a new trial. In November 2009, the Pennsylvania Supreme Court overturned a $3.5 million verdict Ciavarella issued in the non-jury trial of Thomas Joseph vs. The Citizens’ Voice newspaper based upon evidence the case had been improperly steered to Ciavarella. 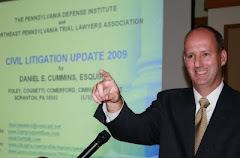 That case remains pending in the Luzerne County Court of Common Pleas.